Annisquam Herb Farm: The joys of a garden . . . The joys of a garden . . . Perfect for a summer night's supper! 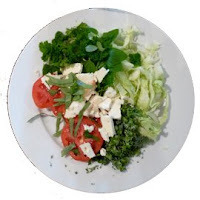 Cabbage, broccoli, tomato, parsley, oregano and a touch of garlic all from the garden today - topped with feta, salt, pepper, olive oil and balsamic vinegar. That looks very appealing for the hot stuffy days we've been having!